Yesterday Karen and I went to an Antiques Fair, which often puts me in an agreeably reflective mood. I like antiques, particularly antique gadgets. If I allowed myself, I could fill a room with old radios (vacuum tubes!) and telegraph equipment (electromagnets!). Fortunately, I remain strong and my home uncluttered. Relatively. I do have a small collection of stereo cards and a stereoscope with which to view them. 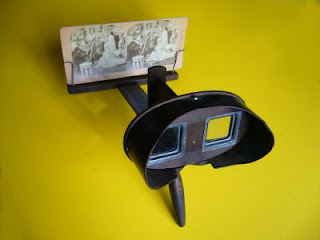 These early 3-D Viewmasters were all the rage in the 1890s. I can imagine Victorian parlors with cabinets full of stereo cards, families and guests gathering after supper to go through them. Like this: a Time Machine that, sadly, only goes one way. Stereo cards were often published in series with common themes: world travel, religious tableau, slice of life. Some were saucy. These cards would have provided a startling "you are there" experience for people who seldom went anywhere. The Holy Land and other exotic locales were popular topics. World capitals. Natural wonders. And folks sure used to love taking 3-D photos of Niagara Falls. A typical stereo card (though not one of mine). If you have the knack for "free fusing," you can see the 3-D effect without a viewer. It's like those "Magic Eye" graphics that were popular a few years ago; don't cross your eyes, just relax them as if looking at something far away, and the two images will merge into a center 3-D image. It's a handy skill for evaluating stereo cards in the store. I don't collect any particular themes; I just look for cards that interest me and are in good condition. It's a cheap hobby--typically $2 to $10 per card. I like photos of places I've actually been myself, as well as vistas of long-vanished life (admirals reviewing an armada of sailing ships, ranks of mounted cavalry, farmhouses on empty plains, cute little kids who all got old and died). Science is always good--one of my favorites is a 3-D image of the Moon, which really drives home the fact that it's a sphere. If you've mastered free fusing, try this one and be dazzled. What I appreciate most about antiques are their connections to other people's lives. I saw a fat loose-leaf photo album yesterday that appeared to capture about 20 years of a young couple's courtship and marriage, including the man's service in World War II. What was a treasure like that doing on a table for me to paw through and pay pennies on the decade for? Why isn't it with their family? Did they not have any? Or was it one of those keepsakes that would have been cherished by someone but instead just slipped away, sold off by a greedy great-aunt at the estate sale? Every abandoned photo album is a tragedy, I think. I once found an old wedding certificate in an antique store. It had small inset photos of the husband and wife, with ornate scroll work and graceful calligraphy. They were married in a small town on the East Coast, and their surname was unusual enough that I thought I had a shot at finding a modern relative. I wrote down the info and went online to find a historical society in their county and, failing that, the town library. The librarian didn't know that particular couple but told me there were families sharing their unique last name all over the place, undoubtedly related. I returned to the antique store and, for sixty bucks, sent a little fragment of someone's history back home, where the librarian was thrilled to get it and hang it on the wall. It was the right thing to do. Yesterday I saw a cross-stitch sampler done by a young New England girl in 1824. What would she have thought if she'd known that in 2013, a man in California--which was still Spanish terra incognita at the time--would admire her needlework? Would that mean anything to her at all? How could it possibly? But don't you wish there were some way to let her know? Karen and I are getting to an age where the artifacts we see have gone from being things we remember in our grandparents' homes to things we remember in our parents' homes to things we actually have in our home. Crying out "hey, I bought that new!" at an antiques fair is an alarming rite of passage. I paid $10 for three stereo cards and Karen picked up a couple of pieces of costume jewelry that looks just like the stuff we used to make fun of my Grandma for wearing but I guess is cool these days as long as you wear it ironically. What our descendants make of it is their problem. Seduced by the crescent Moon, I dusted off my little telescope and took it out for the first time in a long time last night. I don't stargaze as much as I'd like because I'm in a bad place for it: tree canopy blocks most of the sky in my backyard and there's a street light out front. But it was a warm and pretty night, I hadn't yet peeked at Jupiter this season, and I wanted to check out a yellowish star in the southeast that had no business being where it was. So I lugged the 'scope out front and parked it literally under the street light (figured I might get fewer annoying reflections that way) and began my tour. 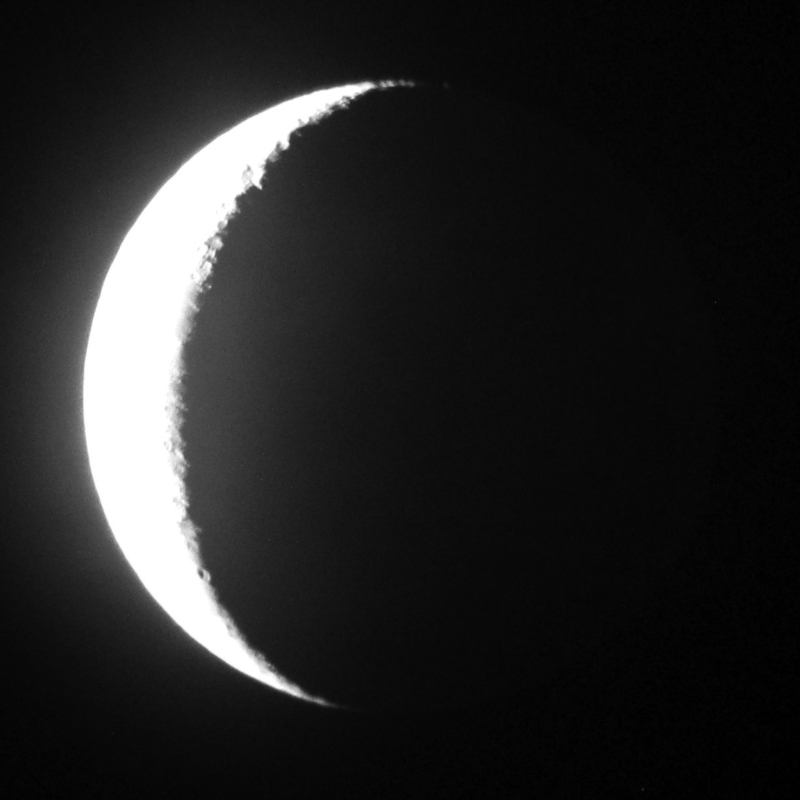 The Moon was gorgeous, Earthshine illuminating its shaded side. Jupiter was low in the western haze, trembling in the warm air rising from my neighbor's roof, but still and always worth a look. 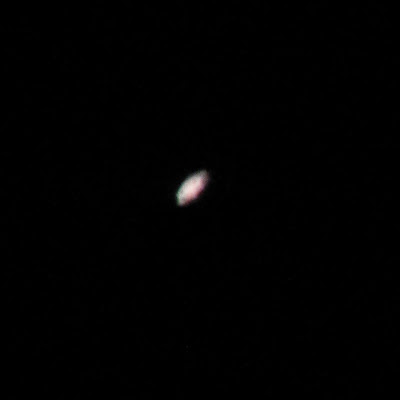 And the yellowish star in the southwest was Saturn, always stunning. When I was in college, and taught astronomy labs once or twice a week and ran my university observatory's public viewing sessions, I really knew the sky. Not just the names of stars and constellations, but where to find the good stuff. I could spin a telescope around and point it right at a nebula or galaxy without looking, and tell you what it was and how it got there. I liked to flatter myself that I knew my 'scope and sky like a mariner knows his ship and sea. I'm not as facile now as when I starhopped two or three nights a week thirty years ago (and had better eyesight), but it turns out I can still bumble my way around the neighborhood. People are often stunned when they see the Moon or Saturn through a telescope for the first time. At public viewing sessions, I had more than one visitor peer into the front of the telescope to be sure I hadn't hung a little model in there. Despite millions of photos a million times brighter and sharper than any image I could show you through my 'scope, there's something uniquely thrilling about seeing it in real time with your own eye. It's authentic. If you're looking at something particularly small or obscure, there's a possibility you're the only person in the universe seeing it at that moment. Anything could happen! Anyway, just before I closed shop for the night, I thought to run inside and grab a camera. I don't have a high-end SLR, just a little point-and-shoot digital camera, and I didn't have the time or inclination to try anything fancy. I literally held the camera up to the eyepiece to see what I could see. My results are below and, to be clear, they aren't examples of my astrophotography prowess that I'm proud of. They're bad. I shot much better pics in college on film. Still, for shoving my camera lens against the eyepiece and clicking away on the automatic setting, I was kind of pleased with the results. Go out, take a look. Get to know your way around the neighborhood. The haze in this photo is real. The fog had started to come in. Saturn. The image is fuzzy because I couldn't hold the camera steady for the 1/8-second exposure. It looked very crisp to the eye. And Her Favorite Film is "2001: A Space Odyssey"
Karen and our girls were exploring the features of their iPhones this weekend and started playing with Siri, the upbeat on-board A.I. They discovered they could dictate a text to Siri, who'd then send that text to whomever she was told. 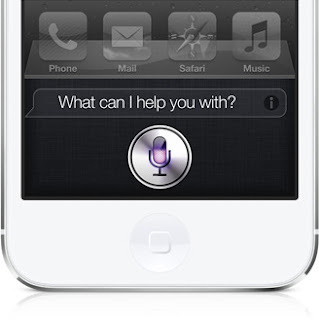 Then the text recipient could ask Siri to read the text aloud. You could do it all by voice! No typing necessary! A 21st Century marvel! I interrupted from the next room. "Isn't that the same as a telephone?" ...for me to get less busy, here's a video of a cute puppy to pass the time. See? The world's not such a bad place after all, is it? You're welcome. I'm in Cave Mode. It's gonna be slow around the ol' Fies Files for a bit. An open-air rotunda on the Mission Inn grounds. The nearby Culver Center of the Arts, where the conference was held. With Ian Williams just before I went on. I like this because it's a casual candid shot. Just hangin'. Signing books. Arthur Frank is standing; to his right is Ian, to Ian's right is me. A good angle on the art exhibition on one side of the hall, with the lecture/seating area behind. None of the artwork was original, they were all foamcore posters printed for the occasion. This was a solution we hit on for the Graphic Medicine conferences as well--as much as you'd like to display original art, the care, security, insurance, and other practical details involved in doing so aren't worth it. If one of these easels falls over (and a couple did), nobody panics. Karen and I at dinner with my sisters on Friday night.